PARIS SEETHED WITH tension in the summer of 1789 as crisis engulfed France. Gripped with revolutionary fervor, the people were clamoring for a greater say in their government. In July outrage grew after King Louis XVI fired his ­reform-minded finance minister, Jacques Necker. A huge crowd of revolutionaries took to the streets of the capital, waving black flags and mimicking a funeral cortège. They bore wax effigies of both Necker and the pro-democracy prince, the Duke of Orléans. Taken from the collection of a well-known waxwork artist, these likenesses may have been sculpted by his apprentice, Marie Grosholtz, who would become better known by her married name: Madame Tussaud. 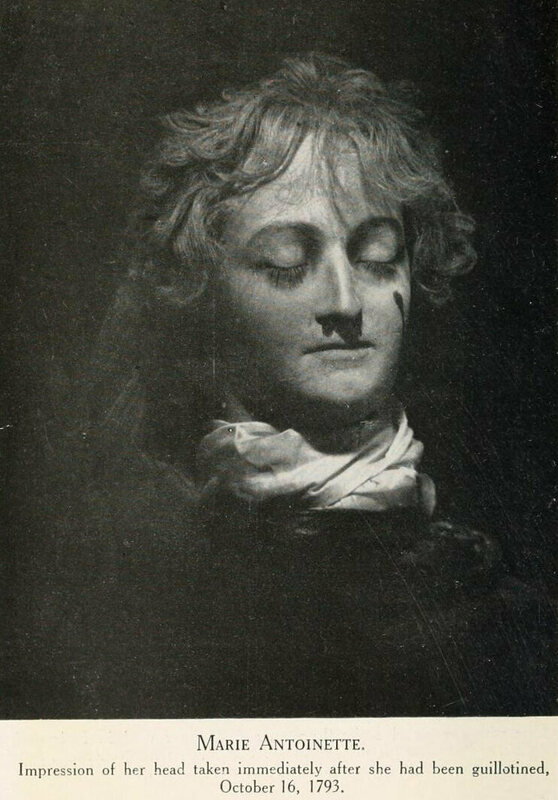 Years later, Marie sculpted a new collection of waxworks inspired by the horrors of the French Revolution that she had witnessed. These figures captured the public imagination and became the foundation of an empire. Blending the famous with the grotesque, today Madame Tussauds wax museums can be found in cities all around the world, inspiring the same fascination of seeing celebrities rendered in wax as they did in England in the 19th century. Madame Tussaud was born Marie Grosholtz in Strasbourg, eastern France, in 1761, months after her father was killed in the Seven Years’ War. Her early childhood was spent in the Swiss city of Bern, where her mother worked as ­housekeeper to the anatomist and wax modeler Dr. Philippe Curtius. Marie prepares a death mask from a severed head during the Reign of Terror. Madame Tussauds, London. Having abandoned medicine to pursue his art full time, Curtius moved to Paris in 1765, and two years later, little Marie and her mother joined him. In the absence of a father, Curtius acted as guardian to the little girl, and she regarded him like an uncle. Curtius’s waxworks had built a considerable following, and his first exhibition in 1770 grew so successful that it was moved to the royal palace in 1776. Curtius taught Marie how to make wax sculptures. She was 15 or 16 when she created her first figure, a likeness of the philosopher Voltaire. She followed it with waxworks of other famous figures, such as the Romantic philosopher Jean-Jacques Rousseau, who would inspire the leaders of the French Revolution, and the American patriot Benjamin Franklin. She later wrote in her memoirs how both were regular guests at Curtius’s Paris home. In 1782 Curtius unveiled a second exhibition of celebrity busts on the Boulevard du Temple. It included a Caverne des Grands Voleurs (Cavern of the Great Thieves), featuring sculptures of criminals, some whose corpses were delivered to Curtius following execution so that he could capture their likenesses. An observant student, Marie would later use this idea for her own Chamber of Horrors. In her memoirs Madame Tussaud recounted how, around 1780, she became a favorite at the palace of Versailles and taught modeling to Madame Elizabeth, the king’s sister. When revolution broke out in 1789, Marie and her mentor, both accused of having monarchist sympathies, found themselves in danger. Curtius, as a good businessman, knew that the best way to survive was to adapt his waxwork collection to the quickly changing times. Revolutionary leaders and those sent to the guillotine became the new stars of his gallery. Marie recalled how during the Reign of Terror that lasted from the fall of 1793 to the summer of 1794, she was arrested, together with Joséphine de Beauharnais, the future wife of Napoleon. She went as far as having her head shaved in preparation for execution. In return for ­clemency, both she and Curtius are said to have taken on a gruesome task—sculpting death masks of the executed. Philippe Curtius died in September 1794 and left Marie the sole heir of his waxwork museums. A year later Marie married François Tussaud, an engineer, and later had two sons, Joseph in 1798 and François in 1800. The marriage grew strained, and times were hard, and Tussaud’s waxworks business was almost ruined by the ravages of revolution. The Madame Tussauds empire might well have never begun had she not met the German illusionist Paul Philidor. A pioneer in the use of the “magic lantern,” which projected colored slides of ghosts and ghouls, Philidor mounted elaborate spectacles known as phantasmagoria. The public was ripe for this kind of new sensory experience and clamored for more. Philidor suggested to Tussaud that they combine his projections with her wax figures to create a joint show for the Lyceum Theater in London. She agreed, and in 1802 traveled to England, to try her luck in a land untouched by turmoil. She was, however, disappointed with the show, complaining that Philidor was failing to promote her startling, lifelike figures. Toughened by the years of danger and revolution in France, this slightly built woman, now in her 40s, decided to go into business for herself and strike out alone in a new country. Loading her precious waxworks into rail carriages, Madame Tussaud set off on a touring exhibition around the British Isles that would last, on and off, for a period of nearly 30 years. Free of Philidor and relying on her own entrepreneurial instincts, Tussaud met with instant fame. The French Revolution and the Reign of Terror awoke fascination, repugnance, and pity in the British, and Tussaud’s creations—Marat stabbed in his bath, the doomed King Louis, and even a model of a guillotine—brought her public face-to-face with the 19th-century equivalent of virtual reality. In every city Madame Tussaud found sumptuous salons where her waxworks were put on display. The exhibits ­attracted paying visitors at a time when public exhibitions of this kind were rarely found outside London. The tours were very popular and profitable. Although Tussaud was estranged from her husband, she still sent money to him and their younger son François in Paris. She learned, however, that her husband was squandering all the money she sent, to the point that François was later forced to sell the part of the waxwork collection that remained in Paris. In 1822 young François came to London for good, joining his mother and brother Joseph. A trained carpenter, François was a good fit in the family business, carving wooden arms and legs for his mother’s wax figures. From this point, the exhibition was renamed and became known as Madame Tussaud and Sons. In 1835 Marie and her sons gave the collection a home in London on Baker Street. By then, executions were no longer public and the so-called Separate Room—later dubbed the Chamber of Horrors by the satirical magazine Punch—offered a tantalizing, if simulated, alternative for ghoulish Londoners. The popularity of the museum was given an extra boost in 1837 when young Queen Victoria allowed her likeness to be fashioned. The resulting waxwork was dressed in an exact replica of her coronation attire and became the exhibition centerpiece. The quiet Frenchwoman, who nevertheless is said to have made death masks from executed London criminals, died in her sleep in April 1850 at age 88. Her sons and grandsons carried on the business. In 1884 her grandson Joseph moved the exhibition to a larger space in Marylebone Road. Although a fire in 1925 and aerial bombing during World War II caused serious damage to the collection, some of the original figures were spared.